Izabella's Tattered Letters: My aching body! Oh...I can hardly move today. Every muscle in my body aches. The kids & I walked from Tropicana all the way to the Venetian last night & walked 2 malls. Didn't get home until 1 in the morning. What fun we had! 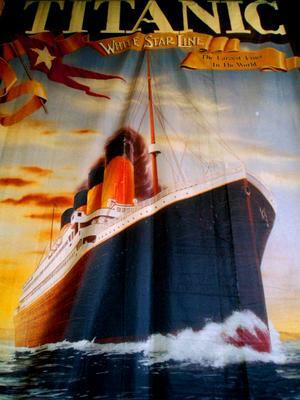 Visited the Titanic exhibition...totally priceless!! I was in tears at moments throughout the walking tour. There was over 300 artifacts, personal & other pieces of the boat on display. We were in there for 2 hours. The personal items were amazingly & painstakingly preserved....money, personal papers, diaries, jewerly, brushes, combs, clothes, wallets, shoes, glasses...the list goes on. It was very touching to see personal articles of people who were lost on that tragic night. At the beginning of your tour they give you a boarding pass, of a passengers' name & info on it & at the end of the tour, there is this huge board of all the passengers names & you can check to see if your boarding pass name was a survivor or lost at sea. Out of the 3 names we had, one boy had died he was only 20. Mr Paul Edvin Andreasson from Sweden. 3rd class passenger. He was traveling to Chicago, Illinois to be with his brother Ernst. In Sweden he had trained for 7 years to become a blacksmith (he started when he was 13!?) Presumbly he planned to look for work as a smith in Chicago. Paul was one of the 108 Swedes on Titanic, almost all of whom traveled in 3rd class. sounds like it's quite a exhibition. i hope it comes here next then. Just found your blog. Very enjoyable. I've been thinking of moveing to LV, so its intresting to hear about life from someone out there. izabella that sounds so moving, especially the end when you check the boarding passes. Thank you for visiting my site and especially for your kind words. I will visit here often. That is such a cool post. I love when they do the exhibitions right. I hope that your soreness goes away and that you enjoy the books. Well done. Thanks complimenting commenter!!! I ab~soul~utley love your blog! Your blog is very interesting. And your pictures are fabulous.